A guide to scooter rental in Bali - the best way of exploring the island! There is no better, more convenient and fun way to see Bali than cruising around the island on a scooter. Imagine yourself driving high up in the mountains, through endless emerald rice paddies, passing lakes, waterfalls and Hindu temples. Or, how about a trip around the whole island, driving right by the ocean with the wind and the sun shining down on your face. It sounds idyllic and it truly is! 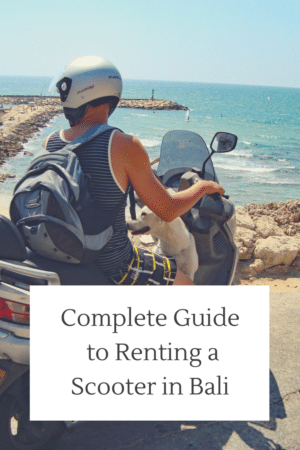 But first, how to rent a scooter in Bali? 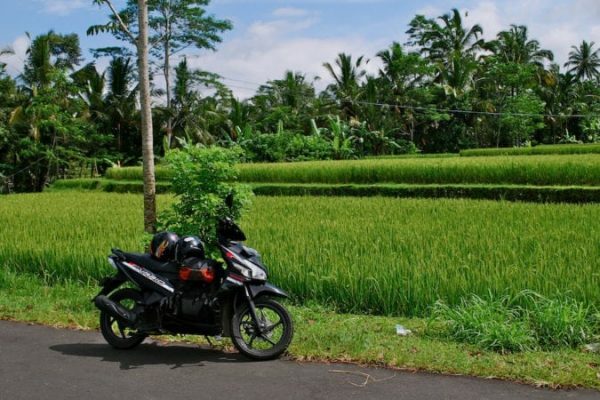 This guide is all about scooter rental in Bali, read it carefully and off you go! 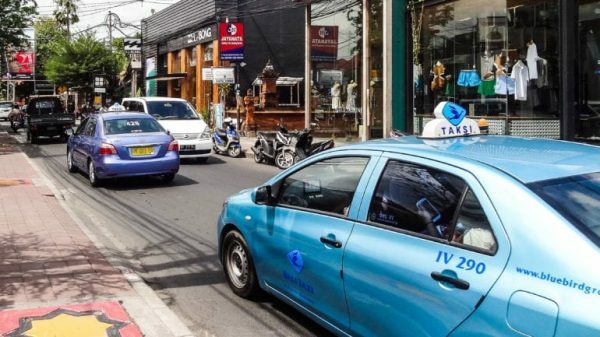 The centers of Kuta, Seminyak and even Ubud can be quite hectic, so you will need to give yourself some time to adjust and see the order in the chaos, but one’s you got the hang of it, you will certainly love it! Outside of the busy centers, the roads are mostly quiet and the scenery breathtaking! 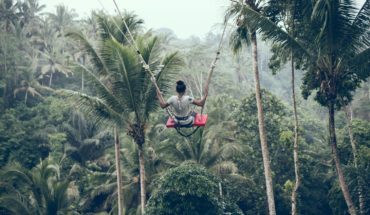 There are a few safety rules you will need to follow to stay safe and sound on your travels and we are here to help! Where to rent a scooter? 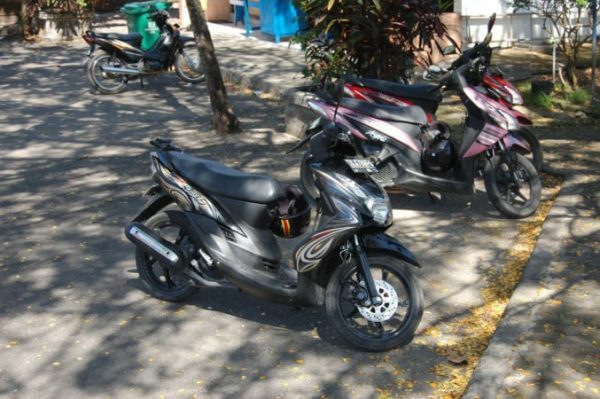 Motor rental shops are found at just about every corner of every street in the busy tourist centers of Bali such as Kuta, Seminyak, Sanur, Ubud and Lovina. However, the safest bet would be to ask the staff at your villa where to go for a good motorbike rental place. 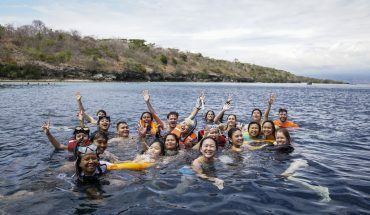 The staff may even hire one for you and bring it to the villa to rent for a day, a week or a month, depending on your needs. Easy and convenient! Daily rental: Rp. 50,000 – Rp. 75,000. Monthly rental: Rp. 600,000 – Rp. 800,000. Don’t hesitate to bargain if they start at a higher price. 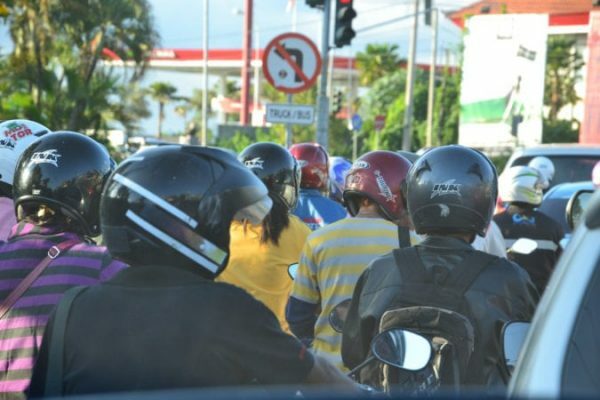 You don’t need an international driver license to rent a scooter in Bali. However, you will need one in order to drive it! 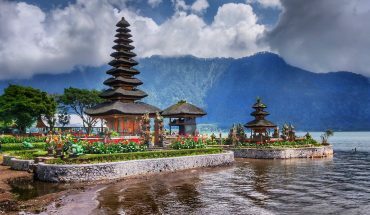 So, make sure to bring an international license with you to Bali. Check the bike from top to toe and make sure the bike owner acknowledges damages should there be any. Also, make sure all the vital features are working of course! Test the brakes, the signals, the lights, the horns to ensure your safety. Yes. Always wear a helmet! This is rule number one when riding a motorbike in Bali or anywhere else in the world! Don’t take unnecessary risks, even though it might ruin your out-of-bed hairdo. It is really essential for your safe keeping, plus, it will help to keep the police off your back. Make sure the helmet fits your head well (there are different sizes). It should be comfortable and definitely not too loose (you don’t want it to blow off your head on the highway!). Insurance should come with the scooter rental but sadly this is not nearly always the case. Ask about it up front when renting your bike, make sure you know what is covered and what is not. Also, check your travel insurance! On some roads, there can be police raids who are sometimes keen on stopping tourist to make that extra bit of money. Should this happen, get ready to bargain and remember to always stay friendly and keep smiling. Having an international driving license will avoid the hassle and fines! Seek out a quiet road to familiarize yourself with the scooter. Position the mirrors in such as way that you can see what’s behind you and start the bike by pressing the start button while holding the brakes (so you don’t fly forward). When the engine is running, your right hand can get the bike to start driving by moving the handle forward. Do this slow and steady, building up speed gradually. Remember that you have to ride on the LEFT side of the road in Bali, which may the opposite of what you are used to at home. Motorbikes are generally made to fit two people. You might see parents with 2 or even 3 kids riding one bike together, but don’t do that. It might be wise to buy a mask if you are driving around in the busy areas of the island. If you tend to be a chaotic person like myself, who tends to lose things like motorbike keys easily (sigh! ), make a copy of the key at one of the road stalls. They are not hard to find and it is cheap. (The word for key is ‘kunci’ in the Indonesian language). Better safe than sorry! Always lock the wheel of your scooter and put your helmet inside the trunk or clip it to the side so that it doesn’t get stolen. Petrol stations are easy to be found. A full tank should cost around Rp. 20,000 and in the case of a flat tire, you can get it fixed at many workshops by the side of the road for around Rp. 15,000. If there are parts broken or if you made any scratches during your adventures, you can fix it at workshops before returning the scooter. Another option is to pay for the damage at your rental place. (might be a bit more expensive). One thing is for certain, you will go home or continue your travels with a great new experience in your pocket and lots of good memories! highly recommend to book motorbike at Bali BikeHouse. Just do it online, they will deliver the bike to your place. I see on your comments that you are saying that you don’t need license in BALI. Wrong! you need to have a valid international driving license . By paying the police , it call bribing and it is totally illegal in Indonesia. I have a drivers license from the USA. Is that sufficient or is an “international drivers license” different? Hi Ed, an international driving license is different. You can apply for it in your home country. It’s called IDP – international driving permit, which you can apply in your home country. I have a drivers license from the USA. Is that sufficient? Hi, I’ve been wondering if it’s a good idea to rent a motorbike on Nusa Penida if I have never driven before and also if I don’t have a car license? Sounds perilously but for me it’s the best way to move around the island. What would you do if you were in my shoes?